Home » Travel Tips » Buying a Drone? Read this first! A drone in its true sense can be a radio-controlled plane, helicopter, quadcopter, small vehicles or any combination of these. Most of the popularly used drones nowadays are quadcopters. They have 4 rotors and a flight controller that is used to stabilize the lift from each propeller. Not all but most of them do. The cameras on toy drones are not equal to the cameras found on a professional camera drone. Toy drones are not capable of recording high-quality video or images. Are all drones capable of shooting good content? You need to understand the difference between a toy drone and a professional drone first. The difference between a camera drone and a toy drone, is that camera drones are capable of recording high-quality content. Professional drones have more flight time, better range, better quality, and more features. You will need is a relatively new IOS or Android device. Most of the drones come with batteries, chargers, controllers, extra propellers, and anything else you might need to go for your first flight. Suggested Read - Check out the iPhone 8s review we did! Drones are pretty easy to fly, and the controls will be slightly different depending on what brand you use. People usually use a controller with their smartphone attached to it as a smartphone will let you see a live video feed and all of the most important flight data you need. Some drones allow you to fly just using your smartphone. All drones that have 4 rotors (quadcopters) will have 4 main controls spread between two joysticks. Foreigners are currently not allowed to fly drones in India. For commercial purpose, they need to lease the drone to an Indian entity who in-turn will obtain Unique Identification Number (UIN) and UAOP from DGCA. 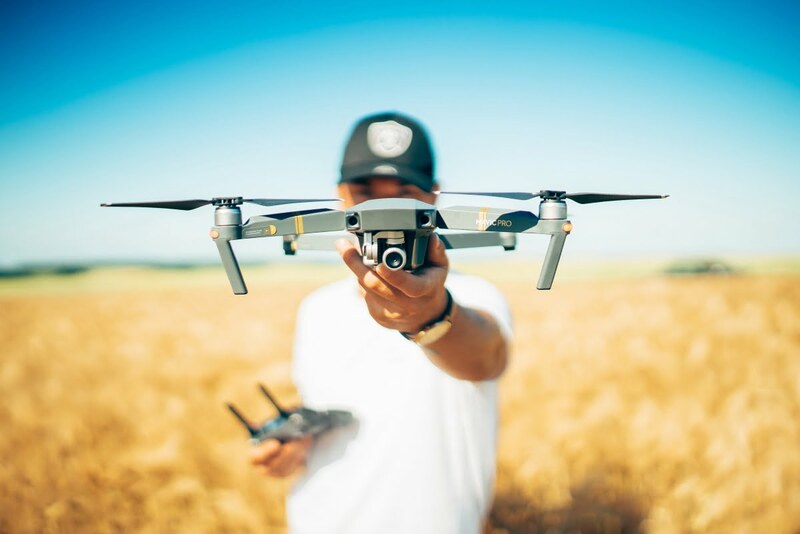 Before every single flight, drone pilots are required to request permission to fly via a mobile app, which will automatically process the request and grant or reject it. India is calling their system “No Permission, No Takeoff” (NPNT). If a drone pilot tries to fly without receiving permission from the Digital Sky Platform, he or she will simply not be able to take off. All drone operators will register their drone and request permission to fly for each flight through India’s Digital Sky Platform. The Digital Sky Platform and further details will be available on the DGCA website on December 1, 2018. Most of the drones listed below are good for beginners. You should take a training course or read up relevant material before taking it for a spin. The best drone with a camera for professionals. Its small size actually hides a pretty high degree of complexity and sophistication, and it’s priced in a way that may give a boost to those die-hard cinematographers. Flying at speed of up to 64kmh or as long as 27-minutes it captures through a miraculous 12MP 4K camera, fully stabilized shot that ensures smooth footage. Vision positioning paired with GPS and GLONASS ensures precise positioning indoors and outdoors. Pros: Compact folding design. Small remote control. Automated flight options. Great 4K video quality. 12MP Raw and JPG stills. Up to 28 minutes of flight per charge. It’s one of the faster drone, capable of reaching a top speed of 72 Km per hour. With 28 minutes of flying time, its an excellent choice for professionals. Weighing over 1.3 Kilograms it takes the best quality pictures sending data to about a range of 1000 meters. It’s smaller, lighter and one of the most portable drones in the market. It houses a 3-axis mechanical gimbal and shoots video at an incredible 4K 30 fps. In addition to a Micro SD card slot, 8 GB of internal storage let you save photos and videos directly to the aircraft and export files through its USB 3.0 Type-C port. Cons: Doesn’t support USB charging. No 4K DCI video. Panorama stitching needs some work. A low flight time of about 18 minutes. Bottom Line: This is the smallest, most portable drone, and is just as full-featured as its larger options. It’s one of the most powerful professional drones in the market but costs a bomb! It is capable of capturing cinema- quality video with an image processing system that records up to 5.2K. For the high price, you get Smart Return to Home, intelligent flight modes, Spotlight Pro and increased reliability. Pros: Magnesium alloy body. Interchangeable cameras. 5.2K video. CinemaDNG and ProRes recording. High-speed Sports mode. Obstacle detection and avoidance. Retractable landing gear and 360-degree camera rotation. Dual-operator control with FPV pilot camera. Intelligent flight modes. Bottom Line: If you can afford it, the DJI Inspire 2 is the best drone you can buy. A mini-drone full of smart features and a good one for beginners. It’s very compact and can be launched from your palm! With decent camera quality and flight time, this could be the best first drone for you to practice on! Cons: Flying time is about 12 minutes. Limited range and speed when controlling with a phone. Video limited to 1080p. No support for 24fps or high frame rate capture. Dedicated remote control is a pricey add-on. The Mavic 2 Pro is the latest flagship drone by DJI. With a promise of 31 minutes of flying time, 1080p video, 12 MP CMOS sensor, Hyperlapse and 48 MP pictures it sure gives crisp quality content. The compact device is intelligent and easy to use that offers an excellent camera system and powerful flight performance. Pros: Compact and feature packed. One of the best in India and an excellent tool for creating high-quality content. Actual flight time is around 24 minutes which is still pretty good. Cons: Zoom quality still needs to be improved on. Compared to Mavic Pro, the precision landing quality is reduced in the Mavic 2 Pro. Bottom Line: Great drone with excellent quality. Bunch of excellent features but still pretty expensive. Active Track feature is really cool! It’s primarily a good photo drone for professionals. With GPS as well as subject tracking, it offers a great number of automatic controls for the drone operator. Its Intel RealSense Technology detects and avoids obstacles while navigating safely through various terrains. Pros: Six-rotor design. Freely rotating 4K video camera. Raw and JPG image capture. Retractable landing gear. Remote control with integrated display. Intel RealSense obstacle avoidance. Supports dual-operator control. Cons: Flying time is roughly 20 minutes. Obstacle avoidance system only works at low speeds. The controller is large and unwieldy. Battery life indicator is confusing to read. Expensive. Equipped with the latest 6-axis flight control systems, 3D lock, More scheduled flight, operating more to the force! Wifi FPV X5SW allows you to view photos & video while flying It supports any IOS and Android phones. The cell phone holder keeps your phone secure all the time, One key 360°roll, continuous roll for perfect action and wonderful performance. Pros: Affordable. Easy and quick assembly. Two flight modes. Bottom Line: Highly affordable drone if you are looking at cheaper alternatives to DJI. It’s a good option to start with before you to move on to the more expensive and feature-packed DJI drones.